In just a few weeks, millions will travel to see the long-awaited total solar eclipse as it cuts across the US mainland. But where can they go to get the best view? Where will the eclipse last longest? How can they get the sharpest photos? Which towns in the path of the eclipse are likely to have good weather…or be snarled by gridlock? Astronomy Magazine knows. The August 2017 issue, on sale now, is the ultimate guide to the Great American Eclipse, offering bonus maps, an exclusive eclipse atlas and more than 300 tips and techniques to give readers the best possible viewing and photographing experience of this once-in-a-lifetime event. The August issue is on newsstands now or available for download at Myscienceshop.com, where you’ll also find solar eclipse glasses for safe viewing of partial phases; a road atlas for traveling to the eclipse; eclipse books that will help solidify lifetime memories of the event; state-by-state eclipse maps; and more. Astronomy editor-in-chief David Eicher is available for interviews and ready to share tips and advice featured in the August issue. 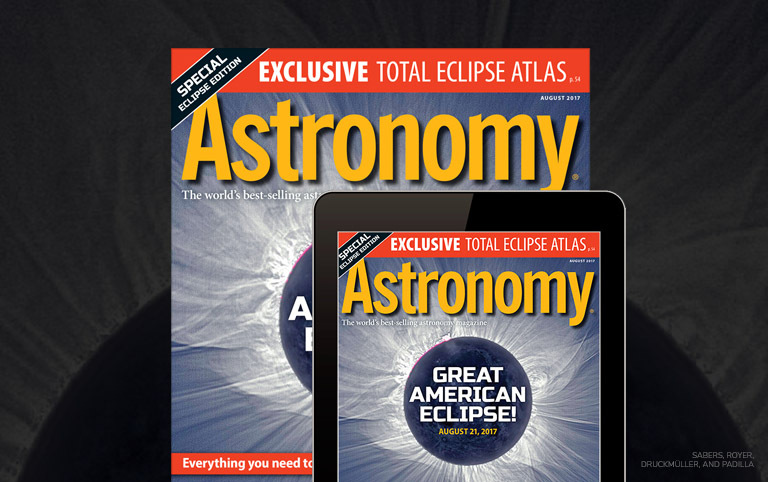 Astronomy Magazine has a print circulation of 100,000, receives 800,000 unique visitors per month to its website, Astronomy.com, and a social media reach of 1.3 million. Altogether, it represents the largest community of astronomy enthusiasts on Earth. Kalmbach Publishing Co., based in suburban Milwaukee, publishes 12 special-interest magazines—including Discover, Drone360, and Trains—and produces related books, websites and events for enthusiasts.